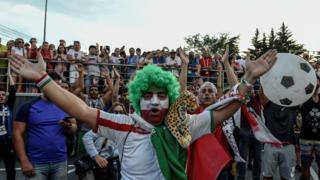 Iran supporters camped outside the Portugal football team's hotel in the Russian city of Saransk making loud noises ahead of their World Cup game. Dozens of fans turned up on Sunday night with vuvuzelas, bells and drums and to try to keep the team awake. Portugal star Cristiano Ronaldo was seen asking the fans for quiet, gesturing that he was trying to sleep. Iran need to beat Portugal in their Monday match to progress to the knockout rounds of the tournament. Video has appeared on Twitter of the noisy fans, and of Ronaldo asking them for peace. Police were first called to the Hotel Mercure at around 23:00 local time, when a first group of Iranian fans arrived at the hotel and began to sing. Ronaldo's appearance at the hotel window reportedly drove the first group to leave, before a second wave of supporters arrived and continued to make noise through the night. Is this Africa's biggest fan at the World Cup? Police reportedly tried to block roads nearby, but the main avenue outside the hotel remained open, allowing a small number of dedicated Iranian fans to keep up the commotion. Arriving on Monday morning after hearing about the distraction efforts, Iran fan Mehdi Fayez said they had to "do all it takes" to win the match. "I love Ronaldo, I love Portugal, but this is a big game," he told the Independent online newspaper. However, female Iranian fan Montreh Fayoud told the Independent that when she realised why the Iranians had gathered at the hotel, she "decided to leave". Paris St Germain fans attempted the same tactics in March, only for Ronaldo to net the winner and push his team Real Madrid into the quarter-finals of the Champions League - a tournament they eventually won in May.